Erin Norleen is a special woman with an open heart. Her goal is to help each client find their specific unique way of restoring their balance. Whether it be physically, mentally, or energetically, Erin feels exactly what is going on and how to deal with each situation. Her goal is not to play the role of convincing dog guardians, but rather to guide them on how they can help themselves so that they can help the dog. Erin has honed in on her own unique way of healing and has already applied this successfully to many dogs and their humans. Seeing Erin grow in her life and naturally in her work is like witnessing a diamond in its pure state as nature intended. Erin Norleen. There aren't enough wonderful things I can say about this remarkable lady. Erin has a very special gift, and one that can't be taught. She's blessed with an awareness and level of sensitivity that most struggle to realize, and uses this in her impactful work with dogs...and the people who love them. I had the opportunity to welcome Erin into my Shadow and Mentorship program recently, and was impressed with what I heard, felt, and saw from her. She seems to understand, on a deeper level, exactly what's needed, and is able to seamlessly blend intuition with theory and practical. She really gets it, and this is something most trainers do not. Anyone who's lucky enough to work with Erin absolutely should, as it'll impact the life of both you and your dog in the most positive way. I'm really looking forward to the mark this fine lady will surely make in the dog training world, and am honored to have played a part in her becoming and unfolding. Erin is a remarkable trainer on so many levels. Apart from her amazing ability with dogs, she is authentic and caring, and has impeccable social skills with her clients. She is one of the most dedicated trainers I've ever worked with and is an absolute natural with leash work. Few trainers excel in all these areas at the same time. She is a rock star! I first met Erin about 1.5 months after adopting a very skittish, nervous, and uncomfortable young dog. I had tried my own methods of training her, none of which worked. As soon as I clicked on Erin's website, I knew she was the perfect trainer for Jasmine and I. During our first meeting, she met Jasmine and very easily showed me that she really needed a strong leader and lots of direction. Erin had brought a book with her ('My Dog, My Buddha' by Kimberly Artley) and had me read a few pages that she knew I really needed. I immediately knew that Erin was the blessing that I was hoping for with Jasmine. ​Shout out to Erin and her innate ability to communicate with, love and understand animals. Beyond just “training” them and giving them the time to socialize with other dogs, she hangs with them, listens to them and helps me to connect with them. It’s through her calm energy, awesome skills and clear perspective on how our dogs fit with our family that she has made the greatest impact on all of us. Thank you, Erin, for making space in your life for us and for caring for my furry family like it was your own. ​We feel so fortunate to have Erin in our lives and particularly in the life of our Weimaraner, Leeroy. Erin has formed a very special connection with Leeroy and his trust in her and fondness for her makes him open to any and all new strategies to help his anxieties and separation issues. We have definitely seen an improvement in his anxiety level since she started working with him. Erin has been totally amazing working with our dog, Griff. When we first arrived on the Coast just over 3 years ago we were unable to find a daycare willing to take him when we needed care because he wasn’t terribly good at socializing with other dogs. ​Erin came to our rescue. 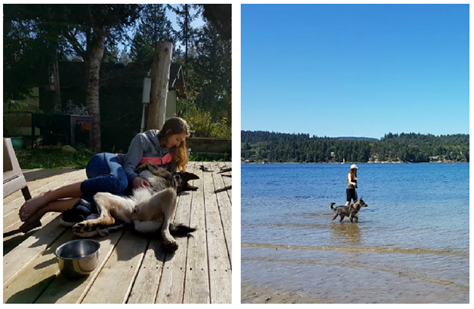 ​​I met Erin when our dog went missing on the Sunshine Coast, and what a karmic meeting it was! ​The first time I spoke with her, her energy was so calming that I became centred, focused and calm, something I hadn’t felt in the four weeks since Cara had been missing. ​From the moment Erin walked in the front door it was obvious she had a gift with animals . She has developed a bond with my bull terrier that still amazes me. I think its because of Erin’s calm and assertive way of connecting with my pets that has allowed them to completely surrender their trust to her. We have found your observations on Haila's behaviour extremely useful. We may have a tendency to view some of her quirks as mostly negative when they are perhaps mainly indicative of the complex canine persona. ​You decipher these behaviours so well. On the whole your presence and advice is very reassuring to us. ​Kayla is a 2 ½ year old Lab/Husky cross with lots of energy and we needed help with training and at times dog sitting. We have known Erin for over a year in that capacity. Over this time, we have found her to be extremely reliable and trustworthy. She has an intuitive gift with our Kayla and have seen this with many other dogs as well. Erin has guided us with great behavioural and training advice for Kayla, even extending to her diet. Erin has a big heart and an impressive understanding of animals. Kayla is always excited to see her. We trust Erin fully with Kayla and our home. We recommend Erin without reservation! ​Hi! My name is Rebecca Campbell and I can't say enough good things about Erin Norleen; she is such a blessing to myself, my dogs Jake, Manny and Monty the cat! Of all the good things about living on The Sunshine Coast, she is in the top 3! She takes her deep love for the animals and really understands where they are coming from, and helps my husband I with our approach and the best way to help our animals. She is definitely a keeper!!! I knew the minute Erin walked through the door of my cabin that Sadie and I were in for a treat! Introductions flowed smoothly and the loving energy that came from her heart was palpable in the room. ​Sadie knew immediately she was in good hands. Erin is a treasure to know, someone who instinctively understood Sadie and the special little Soul she is. My name is Chari, and I am one of the owner/operators of Happy Tails Ranch dog boarding. I first met Erin a couple of years ago when she dropped by to introduce herself. Her resume was impressive, but even more impressive was her obvious affinity for animals. Erin has consistently proven herself to be reliable and trustworthy, but most importantly the dogs love her!